Although METAL CHURCH was undoubtedly key player in the first wave of '80s thrash metal; their more "classic metal" take on the sound and the bad timing of their falling out with original vocalist David Wayne, left them firmly entrenched in the scene's second tier. In spite of producing two of metal's all time classic albums Metal Church and The Dark, METAL CHURCH has really never gotten their dues. They fully intend to change all that with The Weight of the World. This is a near flawless return to greatness for METAL CHURCH. The addition of former ROTTWEILLER vocalist Ronny Munroe was a stroke of pure genius. I am a huge David Wayne fan and Munroe more than wins me over here. His denim and leather tinged voice brings to the table everything Wayne had going for him (sounding not unlike Wayne, to be honest) but Munroe has a better range and more diversity. The music is as sharp and concentrated as it's ever been perfectly straddling that line between thrash and classic metal. 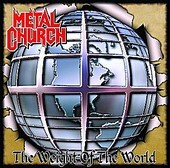 It would probably be disturbing to even guess at how many hours of my life have been spent listening to METAL CHURCH (I was a fan before they originally got signed circa '83-'84), but The Weight of the World ensures that I still have countless hours of worship at the METAL CHURCH ahead of me.